I sat on the patio last night after a stressful week, enjoying one of these. I have never been a big fan of beer. In fact I am quite particular. As I sipped this wonderful cider, memories of my first cider encounter brought laughter and tears. 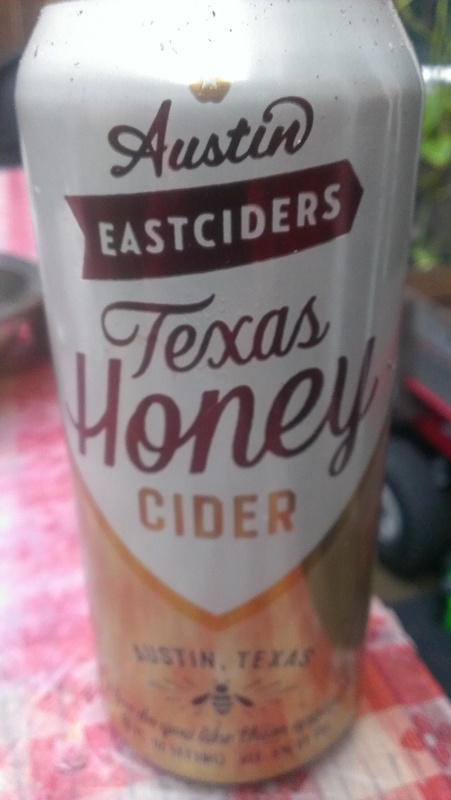 Several years ago, before you could even find cider in stores, my friend Dan and his brew buddies went out to the orchard near Idalou and picked up a bunch of drops. I think we all took a turn at turning the press to juice them. And quite honestly, after juicing I didn’t think much about them again. They had used me for a tasting guinea pig before and some were tasty and some were down right horrible. Dan had called me and asked if I could pick him up from the Brewers Convention in Lubbock. They had entered their batch of cider and a couple of other brews. So, promptly as promised I arrived to retrieve my very excited friend. They had won awards for their cider!! Not thinking hard cider, but apple cider, the kind you get at the roadside stand, I didn’t turn down the glass he offered. It tasted amazing and in the darkness of midnight I didn’t notice what was a beautiful amber beer in the glass until I got to Dan’s house and wondered how I was going to drive to mine. Hard cider has way more punch that just cider. So, I sipped on the cider last night with beautiful memories of my departed friend. Still love and miss him daily. Sometimes, I am often at an impasse as to whether I am supposed to share my dreams. I am never quite sure if they want to hear what I have to say whether it means anything. How much do I share and how much do I add my own feelings and messages from beyond are there. Is what I have been told all for someone else or is it a personal thing between the person crossing over and myself or am I supposed to share it with their family? This morning was one of those ‘go back to sleep we need to talk mornings’. I was dreaming before I was even asleep. I walked through the kitchen of this apt, it was in the early hours just before dawn. I knew there were three things I had to take on this walk with me….a strange old camo back pack, ratty but sturdy, my cell phone but only the camera on it is allowed, and my cat ( who, by the way, is jicky as a road lizard on her best days and would never go walk about). I am walking down a street in Austin. All of a sudden, I am in a small town in what appears to be more West Texas. I say that because of the grass by the sidewalk, by the flat, open skies that are beginning to glow with such a wonderful display of color that I am reminded of sunrises around Lubbock when I was a kid. Only one picture with the phone. I go around a corner of a low brick wall, that is painted white and is about knee high. It turns into a hallway that has no roof made of red brick. As I start around the next corner I stop to see I am on the right side of a pulpit. I know it is a Methodist church, there are seven ministers that preach from this pulpit. The young one I like because he is a speaker of truth. His love is unlimited. The other six are false ministers. I know this church, I have sat in the congregation in a different dream recently. No one has ever told me what type of church, or where this church is, I just know. I turn to leave because the young minister is missing from the pulpit. I don’t want to hear the others for they scare me because there is evil in them. I know if they see me, I will be chased. But there is no way out, the hallway is gone, I am inside the church, it is darkly lit, sconces on the red brick walls, dark carpet, and big wooden doors on each room. Only one door is unlocked and the only way out is through an office. Inside the office is a big room, big book cases filled with heavy volumes of thoughts and hearts of men. The young minister is in there, sitting at a table on a raised platform. There is a pot of tea and two cups. he asks me to sit while he closes out the other six. I am sitting in a big winged-back chair, looking around the room when I notice the ceiling in this room seems miles above me and there is sunlight coming from the top. The kind minister seems to have been over taken. They get in, their voices are deep and booming as they all began to preach at once. Seeming to be staunch, suited men in their graying years, most people would find them scary. I am not feeling scared but instead I am saddened by their ignorance. I am building an anger, my meek and gentle voice is building deep inside. Before I find my voice, a hand finds mine. Pulling me into the kitchen, a friend from long ago, Val. We have been here before, together, knowing the people there, but only in another dream. One that I had put in my diary not long ago but we were there to help celebrate someone. Val dragged me into this church kitchen, filled with bright white cabinets, stainless appliance, and many lights overhead. There is a small area with white pews on one side of the kitchen. I sit beside an older woman, I know her face not only in my dream but in life. She is scared of the ministers, they were chasing her too. She was seeking a man she knew. I knew that all I had to do was think of this man and he would be there. He was, sitting there in a grey suit, not a business suit more like a work uniform. He had sandy colored, really curly hair. He limped, favoring his left leg. I knew this without ever seeing him take a step. I knew that his leg had been hurt long ago, long before this moment. He sat at the end of the pew with it sticking out in the isle. The moment he sat beside her, he took her hand. She smiled, waved at me with her open hand and whispered thank you. The pair were able to leave the church and get away from the preachers. I felt my cat around my ankles, she had been with the kind minister. She could find him when no one else could. Val’s voice broke through the strange silence of the kitchen, she was still trying to change clothes. I stepped down a small hall to the door of a tiny white, very bright bathroom. I pulled from the camo bag two blouses on hangers. Both blouses were nearly identical. Both shades of purple but different shades. Both were the exact same cloth and pattern but two different sizes. I asked her which one she wanted. “That is what you are to decide, which is the one I need.” I opened the door, she is already fully dressed, she pulled me into the tiny bathroom and we were out of the church all together.